Puerta de Hayu Marca doorway, Gate of the Gods found in Peru. 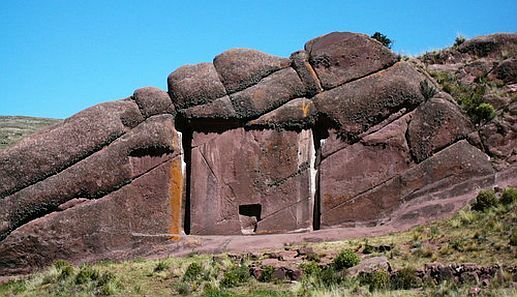 Stargate and Dimensional Doorway Carved in Solid Rock at Lake Titicaca, Peru. Puerta de Hayu Marka Doorway (Gate of the Gods) is regarded as the Doorway of the Heavens (Amaru Meru or Aramu Muru). 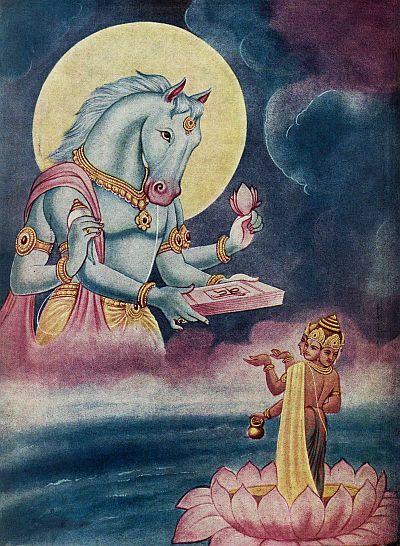 In sanskrit, Haya is Horse and Vishnu Purana mentions about an form of Vishnu, which was horse-headed. According to puranas, Hayagreeva (Haya = Horse, Greeva = Neck) was a demon who was son of Kaśyapa Prajāpati. He gets a boon from the Goddess Durga that he can only be killed by another “Hayagreeva“. Devas (Amaras) approached Lord Vishnu to kill this demon but but despite a long struggle he was also unable to kill Hayagreeva. Tired and drained after the battle, Vishnu proceeded to Vaikuntha to rejuvenate and meditate in padamāsana with his head supported by the upper end of his taut bow. The Devas once again approached Vishnu for help against Hayagrīva but were unable to rouse him from his meditation. The Devas asked a swarm of termites to assist in waking Vishnu by gnawing away the string of the bow upon which he was resting. However, the snapping of the bow string produced such a resonant sound that the universe trembled, and the broken string lashed out with such force that Vishnu’s head was severed from his body. Goddess Durga revealed to Devas of her boon to Hayagreeva and asked them to attach the head of a horse to Vishnu so that he in the guise of “Hayagreeva” could kill his foe. With head of a White Horse, Vishnu was able to kill the demon. Another legend has it that during the creation, the demons Madhu-Kaitabha stole the Vedas from Brahma, and Vishnu then took the Hayagreeva form to recover them. The two bodies of Madhu and Kaitabha disintegrated into twelve pieces (two heads, two torsos, four arms and four legs). These are considered to represent the twelve seismic plates of the Earth. Yet another legend has it that during the creation, Vishnu compiled the Vedas in the Hayagreeva form. That is why Vishnu is worshipped in Hayagreeva form for excellence in education. Ramayana’s Kishkinda Kanda mentions Vanara King Sugreeva talking about crossing Pacific Ocean and landing in South America’s Peru. Here, he reveals about female horse shaped fire coming from within the ocean to destroy the creation. Translation : There exists a fantastically refulgent Fire in the form of Horse’s Face that originated from the anger of Sage Aurasa. The victuals to that Fire is said to be that highly speedy waves of the ocean, together with all of the mobile and sessile beings of the world at the close of each Era. Aurasa derives from the word uuru, meaning ‘thigh.‘ His mother hid him under her thigh when some kings came to kill, and that is how he got this name. Later, with vengeance this sage started to burn the world with his yogic fire, but his manes came to him to pacify and asked him to release his yogic fire in oceanic water. When he did so, that fire remained underwater, ready to emerge from a cavity like that of a she-horse’s mouth, from beneath the ocean from the South Pole. This fire is called vaDaba agni, or baDaba anala , referred here as Horse’s Face. At the time of yuga anta, End of Era, that fire emerges out, and the whole creation, with all its sessile and mobile beings, becomes its fuel. This episode is detailed in aadi parva , First Canto, Maha Bharata. Transaltion : There the high squealing sounds of oceanic beings dwelling undersea are audible, and although they are capable ones, they are incapacitated on feeling Fire from the Horse Mouth as such they yell. So, Technically, Vishnu must have subsided this demon like fire emitting in Horse shape around ‘Ring of Fire‘ and saved creation or helped Brahma in recreation and also restored Vedas from getting destroyed. Peruvian prophecy states that all the Americas were once united by a common spiritual tradition and leader, and that they will be again. They were anciently united as Amaru-ca or Ameru-ca, Ameri-ca, meaning the “Land of the Serpent” (Ananta Sesha forms the Ring of Fire around North & South American continents), during a time when the serpent was the universal symbol of mystical wisdom and spiritual power. One legend states that North and South America were named after a culture bearer known historically as Aramu Muru or A maru (serpent/wisdom) the “Serpent (wisdom master) Meru,” with connections to the mythical Mount Meru, abode of the Demi-Gods. Infact, Ameru is A-Meru (anti-meru or opposite of meru mountain). Peru must also be a distorted form of Meru or opposite to Meru, as it is almost half day (10.5 hours) behind Indian time. The passage at Puerta de Hayu Marka, God Viracocha (Wamana, an incarnation of Vishnu), who sent king Bali to Paataala (South America) (as Brazil is exactly on the opposite side of India in globe.